Any communication between the two cores has to be done over the external FSB, and obviously, core-to-core communication over an external bus is slow. It particularly doesn't make sense, since the two cores are on the same die. Even the 65nm successor to the Pentium D (Presler) will have this same limitation. AMD's architecture is much more sophisticated, thanks to the K8 architecture's on-die North Bridge. While we normally only discuss the benefits of the K8's on-die memory controller, the on-die North Bridge is extremely important for dual core. 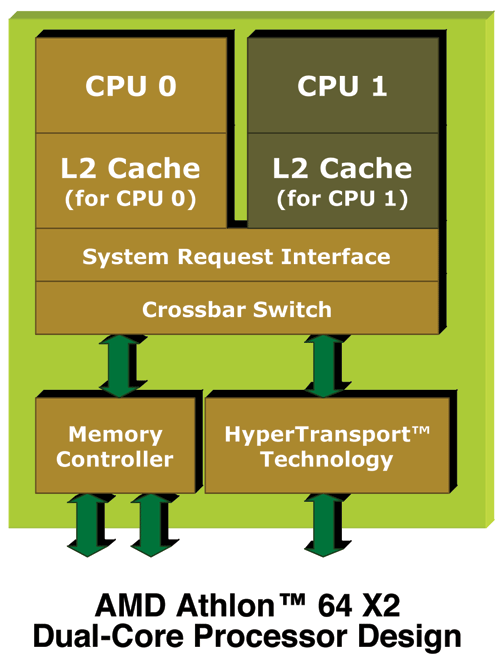 Instead of having all communication between the cores go over an external FSB, each core will put its request on the System Request Queue (SRQ) and when resources are available, the request will be sent to the appropriate execution core - all without leaving the confines of the CPU's die. There are numerous benefits to AMD's implementation, and in heavily multithreaded/multitasking scenarios, it is possible for AMD to have a performance advantage over Intel just because of this implementation detail alone. The one limitation that both AMD and Intel have is bandwidth. In order to maintain compatibility with present day Socket-940 and Socket-939 motherboards, AMD could not increase the pincount of their dual core processors. The benefit is that AMD's dual core CPUs will work in almost all Socket-940 and Socket-939 motherboards (more on this later), but the downside is that the memory bus remains unchanged at 128-bits wide and supports a maximum memory speed of DDR400. So, while single core Athlon 64 and Opteron CPUs get a full 6.4GB/s of memory bandwidth, today's dual core CPUs are given the same memory bandwidth to share among two cores instead of one. AMD's solution to the problem will come in the form of DDR2 and a new socket down the road, but for now there's no getting around the memory bandwidth limitations. Intel is actually in a better position from a memory bandwidth standpoint. At this point, their chipsets provide more memory bandwidth than what a single core needs with their dual channel DDR2-667 controller. 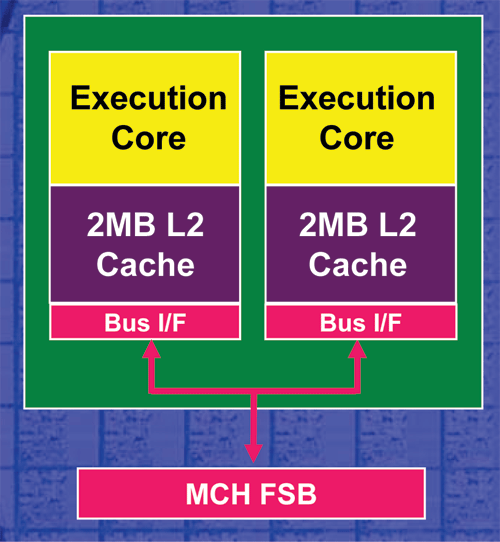 The problem is that the Intel dual core CPUs still run on a 64-bit wide 800MHz FSB, which makes Intel's problem more of a FSB bandwidth limitation than a memory bandwidth limitation. - On the desktop, the Athlon 64 X2 series is fully compatible with all Socket-939 motherboards. All you need is a BIOS update and you're good to go. - For workstations/servers, if you have a motherboard that supports the 90nm Opterons, then all you need is a BIOS update for dual core Opteron support. If the motherboard does not support 90nm Opterons then you are, unfortunately, out of luck. For desktop users, the ability to upgrade your current Socket-939 motherboards to support dual core in the future is a huge offer from AMD. While it may not please motherboard manufacturers to lengthen upgrade cycles like this, we have never seen a CPU manufacturer take care of their users like this before. Even during the Socket-A days when you didn't have to upgrade your motherboard, most users still did because of better chipsets. AMD's architectural decisions have made those days obsolete. The next generation of dual core processors will most likely need a new motherboard, but rest assured that you have a solid upgrade path if you have recently invested in a new Socket-939 desktop system or Socket-940. Nicely done. The price will be a factor as usual. Does the performance gain justify the cost? For the enthusiast yes, but I will wait a bit. My 754 setup with a raptor still rocks plenty enough for me. The technology improvements are great. I will always be a big AMD Fan.